Two weeks ago a man in Egypt’s Qena governorate, some 450km southeast of Cairo, found a suspicious stork among four others near his home and brought them to the police. It made headlines because an electronic device was attached to it's wing and the bird was immediately suspected of being a spy in the security heightened country as the practice of using birds in this manner is not unheard of. On August 31st, a veterinary committee called in by officials, determined the device was neither a bomb nor a spying device but a wildlife tracker used by french scientists to follow the movement of migrating birds. Ayman Abdallah, head of Qena veterinary services said the device stopped working when the bird crossed the border. 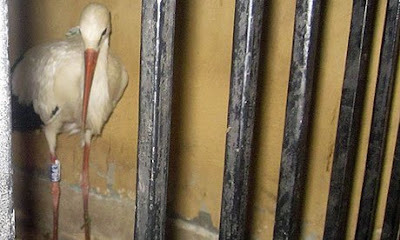 The stork remained incarcerated in the police station until September 4th when it was visited by a number of unidentified officials with UN identification. Although unconfirmed, it was believed that among them was Colonel "Whopper" Creedon of UNETIDA/UNPASID who was known to be in the country. The Stork was released later that day according to Al Jazeera. It was reported by most major news outlets yesterday that the stork's body was discovered on an island in the Nile, south of the ancient city of Aswan on Saturday, September 7th. Reports are that local villagers killed and ate it - therefore FOWL PLAY IS SUSPECTED! Thank you , please have the veal , he'll be here all week. I'm guessing the Stork was imprisioned because he was a flight risk?